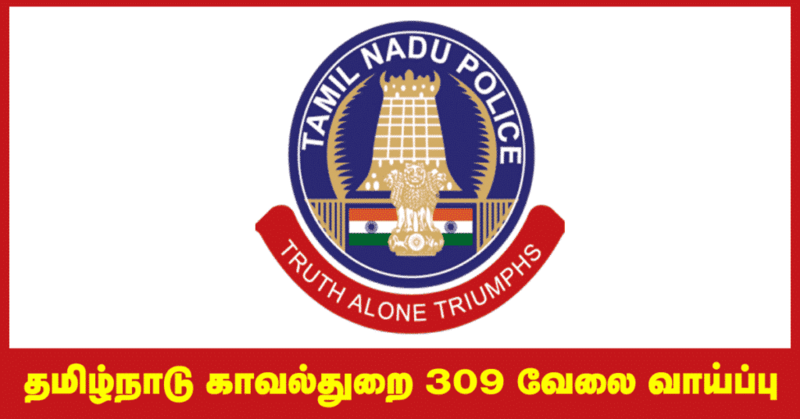 Tamilnadu Police recruitment 2018 – Tamil Nadu Uniformed Services Recruitment Board – TNUSRB recruiting 309 candidates to fill their SI Technical job in Tamilnadu. Aspirants are requested to go through the latest TN Police job notification 2018 fully, Before applying for this job. Tamil Nadu Uniformed Services Recruitment Board – TNUSRB (TN Police) career comes under the Government job. This is the best opportunity for the job hunters who are looking for the Career in TN Police. Tamil Nadu Uniformed Services Recruitment Board – TNUSRB organization job applications are collected by online mode, through http://www.tnusrbonline.org/. TN Police inviting the SI Technical job online applications from 11.07.2018 to 10.08.2018. The interested and eligible candidates can able to apply for this job easily. Do not miss the wonderful career opportunity in Tamil Nadu Uniformed Services Recruitment Board – TNUSRB. The detailed information on TN Police latest job notification 2018 has been given below. The job hunters are requested to read below the TN Police job selection process, eligibility, salary, age limit and applications fee in our Tamilan Jobs website. Aspirants stay tuned in this page for upcoming changes in TN Police SI Technical job 2018. For more accurate information on this TN Police job notification, check their official website http://www.tnusrbonline.org/. Tamil Nadu Uniformed Services Recruitment Board – TNUSRB (TN Police) has released the following vacancy details with their recent recruitment. They give the huge surprise to the candidates. They invite 309 Candidates to fill their vacancies. You can check their job vacancy details by below. Tamil Nadu Uniformed Services Recruitment Board – TNUSRBrequires following posts to fill their vacancies. Check the latest job vacancy details below TN Police 2018. As per the recent Tamil Nadu Uniformed Services Recruitment Board – TNUSRB (TN Police) notification 2018, the eligibility details for the SI Technical job has given below. It is very important to check your qualification for this opportunity. If you have less qualification, you may not able to apply for this career. Here below you can find age limit and educational qualification required for TN Police SI Technical job 2018. Candidates are requested to check their education qualification required for various Tamil Nadu Uniformed Services Recruitment Board – TNUSRB (TN Police) job opportunities. B.E/B.Tech Degree in Electronics and Communication engineering recognized by All India Council for Technical Education. To apply Tamil Nadu Uniformed Services Recruitment Board – TNUSRB job, the candidates required to attain the following age limit. The notified aged candidates only can able to apply for the job vacancy. check the age limit details below. For more reference kindly check the TN Police official notification 2018. To apply for the 309 SI Technical job in Tamil Nadu Uniformed Services Recruitment Board – TNUSRB the candidates requested to pay the application fees by notified mode. The payment mode may be both online/offline. Here below the caste-wise application fee payment details are given below. Tamil Nadu Uniformed Services Recruitment Board – TNUSRB (TN Police) 309 SI Technical Job salary details has been given below. The candidates can check various salary information below. Tamil Nadu Uniformed Services Recruitment Board – TNUSRB (TN Police) may follow the following process to select the candidates. Accurate information checks the official website. How to apply for Tamil Nadu Uniformed Services Recruitment Board – TNUSRB (TN Police) Recruitment for SI Technical Job? Step 2: Search for SI Technical notification link in the careers/ Advertisements/ News page. Step 4: Check and verify your eligibility to TN Police Recruitment 2018. If you are not eligible for the job notification, ignore and leave space for others. The following important dates need to be remembered by the Tamil Nadu Uniformed Services Recruitment Board – TNUSRB (TN Police) candidates. TN Police Notification 2018: click here! Tamil Nadu Police Recruitment brochure: Click here! TN Police Recruitment Apply Online: Click here! Sir I am DHA,BBA,MBA.my aim police sir.Apply pannalama sir. i’m Kishore kumar i completed BA(Economics), can i apply for this job? while moving to online payment the site is not opening whats the reason sir. I’m abhinaya i had completed diploma in ECE now doing BE FINAL YEAR am i eligible fr this requirement..? and the questions from GN & TECHINAL will be in tamil or english..? can i have any model question papers for this..? Sir i have completed diploma ECE. How can i apply for the job? i have complete b.tech ece .. can i apply? I have completed M.Sc ECS,I’m eligible for this post? I’m eligible for this job ah sir??? He is eligible for this job sir??? I’m eligible for this job ah sir.???? Whether BE -CSE candidates can apply? Am completed DECE can i apply this job. I am From AP. my qualifications is MCA. can i apply for this job ? can l eligible for this post.. I completed b.e cse.. Am i eligible for this post? Hello sir,. I have completed B.Sc (mathematics).i’m eligible for this post? Hello sir., I have completed b.sc (maths) I’m eligible for this post? BE EEE STUDENTS are eligible for this technical SI? I have completed my UG degree in the field of B.Sc Networking. Can I apply for this post ? Hi I am vignesh bsc computer science completed i am interested only police pls accept…. i am completed bechlor of computer application(BCA), i’m eligible of this post. I have Completed B.E Electrical and Electronics Am I eligible for this post? I’m completed diploma in electrical and electronic engg. I’m eligible for this requirement sir. Kindly share me.